Apple Inc. (AAPL): Is the Market Crazy For Valuing It at Less Than $400 a Share? Many investors have written off Apple Inc. (NASDAQ:AAPL) since the stock reached dizzying heights of more than $700 per share in September 2012. Since then, Apple Inc. (NASDAQ:AAPL) stock has lost over 40% of its value, and those same investors are asking the question: “Is Apple a smart value play?” Let’s review both sides of the argument. Apple Inc. (NASDAQ:AAPL) has a loyal fanbase and a strong brand. In fact, Forbes ranked the Apple brand the most powerful in the world. That not only impacts whether a customer sticks with Apple Inc. (NASDAQ:AAPL), but also creates pricing power Apple displays in its huge gross margins. Think about how much you rely on devices that didn’t exist 10 years ago (smartphones, tablets, etc.). Although technology has come so far in the last decade, it still has many new things on the horizon, and Apple is prepared to be a key player in those developing markets. Rumors suggest that Apple has been developing a smartwatch that could consolidate some activities for which we now rely on our phones and fitness devices. In addition, Near Field Communication (NFC) — which enables easy ways to pay via your mobile phone — could become mainstream with the next iPhone release and an overhaul of Apple’s Passbook app. Apple is an innovation machine — especially for things you never realized you needed. Minus one VERY critical member (co-founder and CEO Steve Jobs), the core staff of that machine remains intact. Tim Cook is known as an operations genius. Apple’s creative guru and innovator of their coolest designs, Johnny Ive, is still there. Apple isn’t the same Apple without Steve Jobs, but it is still Apple. Finally, does the below chart look like a dying company? Yearly revenue is almost progressing exponentially. 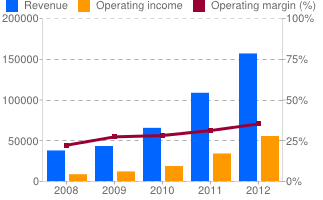 The operating income has more than tripled in the last four years. Oh, and their margins continually rise (showing the strength of the brand loyalty and operational efficiencies) . Tim Cook is no Steve Jobs. He’s been active CEO since January 2011, yet the company has released no revolutionary products during that time. Sure, Tim Cook is heralded as an operations genius, but does he have what it takes to hold Apple to the strict creative standards that made it famous? Apple Inc. (AAPL): The Single Greatest Challenge Investors Will Face on Tuesday... Google Inc (GOOG): Does It Need to Change Its Business Plan? Radian Group Inc (RDN), Apple Inc. (AAPL): Here’s What This Big Value... Apple Inc. (AAPL) Is Killing My Portfolio Google Inc (GOOG), Apple Inc. (AAPL) & The Three Largest Surprises in... Apple Inc. (AAPL): How Cheap Will The “Cheaper” iPhone Be?